Villagers and NGOs are trying to stop a British-registered company developing a gold mine which could drastically affect the livelihoods of fisherfolk living in Rinondoran Bay, North Sulawesi. Protests in Jakarta by community representatives from North Sulawesi against gold mining and its impacts on the marine environment, livelihoods and human health: the words 'Newmont', 'Buyat Bay' and 'STD' quickly spring to mind. 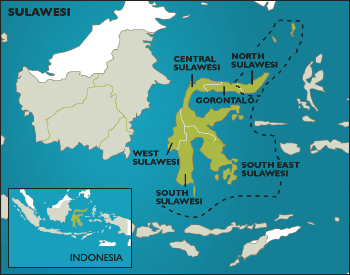 This article, contributed by YL Franky of the Alliance of Indigenous Peoples of the Archipelago (AMAN), highlights ongoing protests against Inco, the Canadian-owned nickel mine at Sorowako, South Sulawesi. Indigenous people affected by Inco's mining in Sorowako*, mineworkers, students and NGOs who have formed the Mine Victims' Solidarity Forum (FSMT), mounted a four-day occupation of the company's regional office in Makassar, South Sulawesi, from September 15 - 19th. NGOs in Indonesia have worked hard to convince their government that it should do more to protect farmers and consumers from the risks of genetically modified crops. Now their efforts have borne fruit. Indonesia's parliament began the process to ratify the Cartagena Protocol on Biosafety in July 2004 - a move that should ensure greater protection against the potential negative impacts of genetically modified organisms (GMOs).